Gadabout Grahame is a name I bestowed upon myself simply because my greatest love is to travel the globe in search of new beginnings. 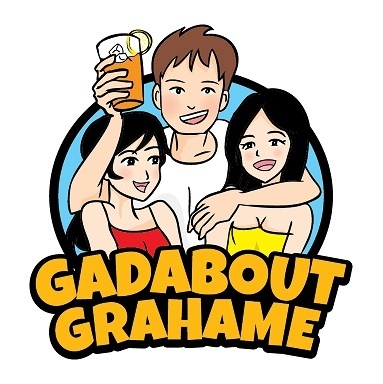 According to the Collins English Dictionary, the word "gadabout" is a noun meaning "pleasure seeker" It describes me to a tee and blends in with my name Grahame perfectly. That's Graham with an "e"
My quest is to meet new and interesting people and to learn all I can about the diverse cultures on this beautiful planet in which we all live. I'm an artist, a writer, an entrepreneur, an adventurer, a teacher and a nutritional guidance counsellor who's forever shifting direction in an ever changing world. My story began the moment I took my first step outside my comfort zone and into the vast open wilderness. Before my journeys began, I decided to familiarise myself with learning another language other than my mother tongue. I took a three-month Spanglish course thinking that with this in hand, I was good to go in Europe. Though I don't practice the language much these days, I can speak enough Spanish to get by. And that was nearly thirty years ago. 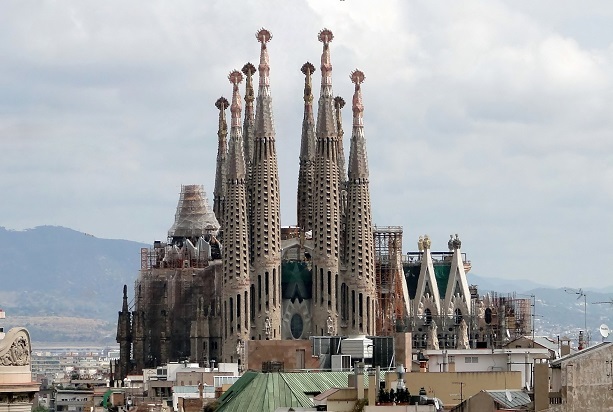 Spanglish is a mix of Spanish and English. I am now trying to learn to speak a little Thai too. 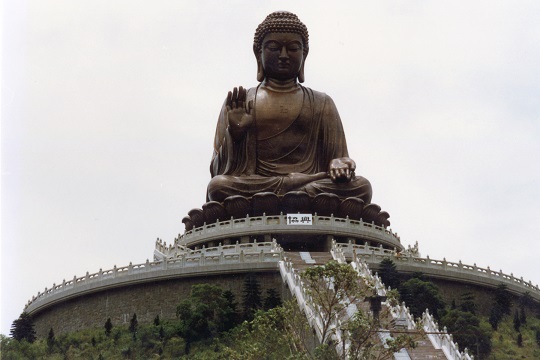 I also studied to become an English teacher so that I can continue my travels to countries such a China, Vietnam, Russia, Mexico and wherever else my travels might lead me. In 2012 I became eligible for a British passport as the rules in the UK had changed whereby I could now apply for citizenship on my mother's side. Before that I was denied the right as my father and I were both born in South Africa. While it took two years to obtain the documentation due to my South African heritage, in July 2017 I got a knock at the door and standing there was the postman with my British passport. It allows me to live and work in the U K. I had finally done it. Gadabout Grahame is now off to explore the world one more time beginning in Spain but who knows where the journey will end. My travels began when I left South Africa (the place I was brought up) to embark on a six-month round trip to the United Kingdom, my mother's birthplace. 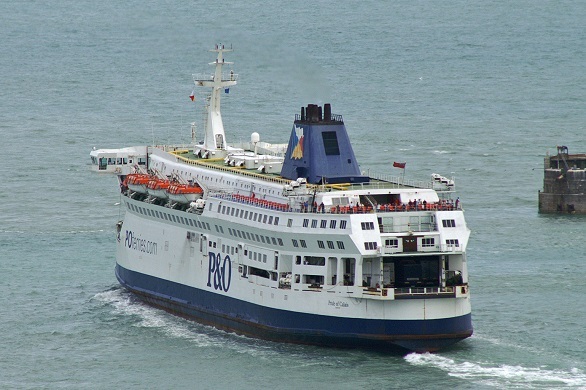 I was later to cross the English channel by ferry to explore all the sites and sounds of Europe. It was way back in 1987 and the underground tunnel to France was still on the drawing board. I originally travelled with my then South African girlfriend Veronica, who could only spend two months with me due to work commitments. At the time I was my own boss and could come and go as I pleased. I tried having a regular job, but somehow that didn't quite suit my style. Before setting off on my trip to the United Kingdom I joined the "walkabout club" in the UK. Apparently, when you join, you automatically become a lifetime member. I'm not sure if the organisation still exists today as I haven't been back to the United Kingdom to ever find out. One of the benefits was that the club arranged to pick Veronica and myself up at Heathrow Airport and take us to central London from where we could easily connect to our hotel. They also provided a service whereby you could apply for a working visa, not that I came to the UK to find work. However, I did contact the club at one stage to ask if they knew of anyone who wanted to accompany me on a trip to Spain and Portugal as at the time Veronica had since left to go home. I had purchased a camper van for my journey around the UK and Europe. Also, before leaving South Africa in April of 1987, I purchased a voucher, known as an English Heritage Overseas Pass, which permitted me to visit over six hundred national heritage sites, historic homes and gardens belonging to the National Trust. It was a one-month membership costing less than five British Pounds at the time. You can still apply for these Overseas passes today, but the membership fees are a lot more expensive considering what I paid for it back then. I am quite shocked at what one has to pay today for not only fewer sights to see but also fewer days in which to visit the sights. My first port of call was a visit to Broadlands (home of Lord Mountbatten) near the town of Romsey in Hampshire. Broadlands was also where Prince Charles and Lady Diana spent their honeymoon. 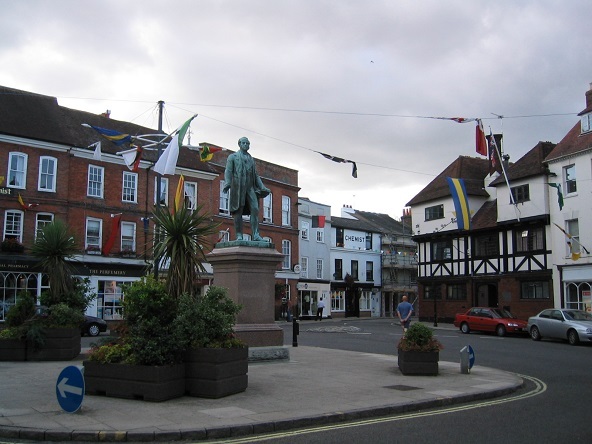 Romsey was where my mother grew up and where in the town square, my grandfather ran his pharmacy until the end of World War II before leaving for South Africa in 1949 with my grandmother and mother. I had just thirty days and six hundred sights to see across England, Scotland and Wales. It was a huge adrenaline rush, but I enjoyed the time spent touring the continent and managed to put in a lot of miles and visit one hundred and twenty interesting castles, abbeys, Roman ruins and prehistoric monuments. I got to view Stonehenge, Hadrian's Wall, Warwick, Edinburgh and Cardiff Castles, and many other amazing places. 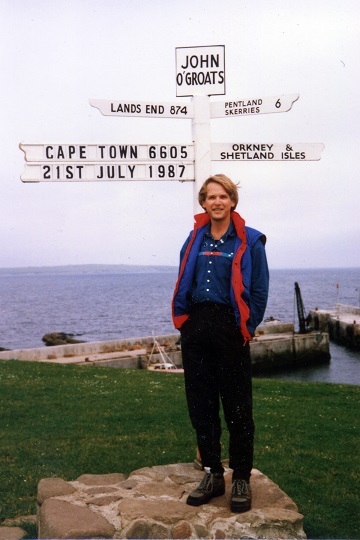 I drove across the length and breadth of the United Kingdom from Lands End in Cornwall, England to John O' Groats in Scotland. Before Veronica and I set off to Europe from the port of Dover in the UK, it was decided that we'd travel by road in our camper van from France to Greece only because of Veronica's two-month time limit. It was a toss up between going to Spain and Portugal or to go to Greece and Veronica chose Greece. We simply couldn't do both. I was later to travel to Spain and Portugal with a young couple from New Zealand. At the time Veronica and I were travelling on South African passports and had to secure visas for just about every country in Europe except Switzerland, Germany and Greece. You have to understand that in 1987 South Africa was still an apartheid state and travelling overseas for us was no walk in the park, so to speak. After arriving in Calais, France in the early hours of the morning (it was still dark) we disembarked the ferry and headed for Paris. What we didn't realise was that from the port of Calais, we simply followed another vehicle as it drove straight out of an open gate without going through any kind of custom protocol. We were none the wiser. No passport stamp, only a sign showing us the road to Paris. Off we went. We arrived in Paris way after the sun had come out that day and because we were exhausted, decided to have a nap in the camper van right in one of the busiest parts of town. We were new to travel in a foreign country. We pulled the curtains closed and went to sleep. At the time locals were going about their daily business. I am not sure how long we were asleep but woke up to hear a car behind us being towed away. Hopping into the driver's seat I immediately sped off. Gadabout Grahame and his lady friend were on their way again and not a moment too soon. It was to be one of many close calls to come our way. Next, we found our way to Orly Airport to get information on campsites in the capital. 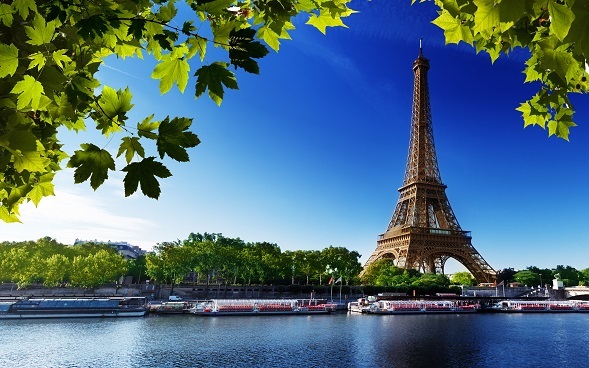 We found one on the outskirts of Paris, but close enough to one of the Metro train stations. At the campsite, we met and made friends with several wannabe travellers from other parts of the world. With our new found friends, we went on to see a number of well-known landmarks in Paris, including the Eiffel Tower and the Louvre. After France, we went to Switzerland to see some real snow (we didn't get much snow back home) and to climb a mountain. Veronica loved Switzerland and wanted to stay but we had to move on. I found Switzerland to be super friendly, clean as a whistle and it gave me a chance to visit one of the sites portrayed in a James Bond movie featuring Rodger Moore. 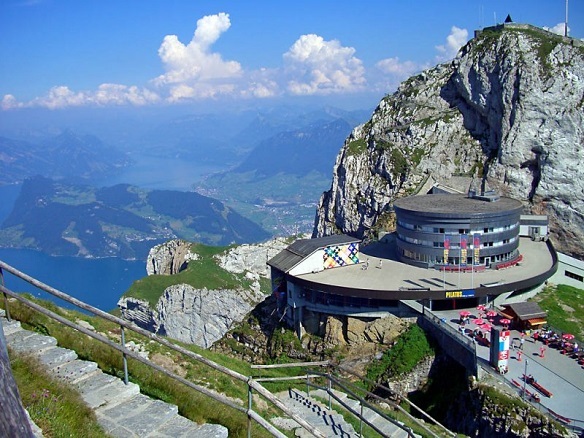 It was Mount Pilatus, overlooking Lake Lucerne. Going up Mount Pilatus was the highlight of our visit. It was mid-June in 1987 and there was still some snow about. We booked a $10 (that was the price at the time) round trip beginning with a boat ride across Lake Lucerne. Thereafter, it was an aerial cableway ride up one side of the mountain and the world's steepest cogwheel railway down the other, then onto a bus for the final journey back to our campsite. Italy was a real blast. I loved Italy. Veronica and I travelled from the north to the south and from the east coast to the west coast but not in that order. Initially, we arrived there in our trusty van via Switzerland from the Swiss-Italian border at Como and down to Milan and Genoa. We kept off the freeway to save costs and drove along the west coast. It was great fun, but at times, a little scary in our camper. Just outside Genoa we caught sight of two young hitchhikers who we found out were from Scotland and decided we'd give them a lift. We were later to regret it which I'll tell you about in a minute. These kids were on their way to Malta and we're pleased that we stopped after spotting our British registered vehicle. Once the introductions were over and we had told them where we were heading, they were happy to accompany us to see the Leaning Tower of Pisa and the rest of what Italy had to offer. From there it was to be Florence, Rome and Naples. 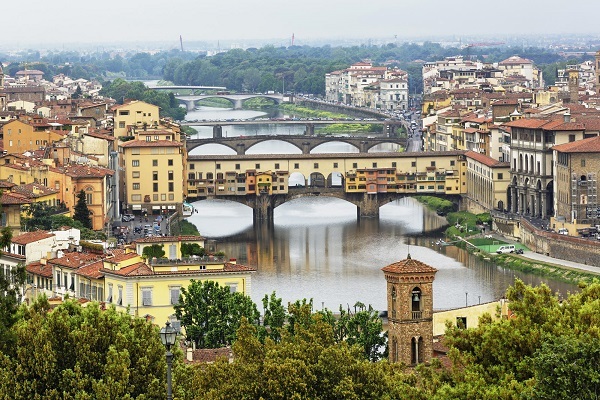 While Florence was (and still is I'm sure) a fabulous place to visit, it had an unfortunate outcome for Veronica and me, which we were only to discover much later on. As it happened, we had all our traveller's cheques stolen from our camper van while we had gone for an evening shower at the campsite we had booked ourselves into. We couldn't prove it, but I was certain the two boys had something to do with it. I have been on a number of trips to Greece, a place you have to add to your bucket list. The first time was with Veronica and then again several more times with my South African friends who are now living in Spain. After ridding ourselves of the boys from Scotland, Veronica and I loaded our trusty camper van onto the ferry and set sail for the island of Corfu. We spent a couple of days on Corfu Island before going to the mainland. After that we headed north, crossing the Corinthian Strait and then on to Athens where we did all the touristy things like going to see the Parthenon and wandering around the quaint cobblestone streets. It was now time to board another ship to the island of Santorini in southern Greece, a trip I might add, that took several hours to reach. We left the camper van at the port of Piraeus and hopped aboard the ship which was fully loaded with tourists. Once there we soon settled into a small self-catering apartment and stayed for a whole week. 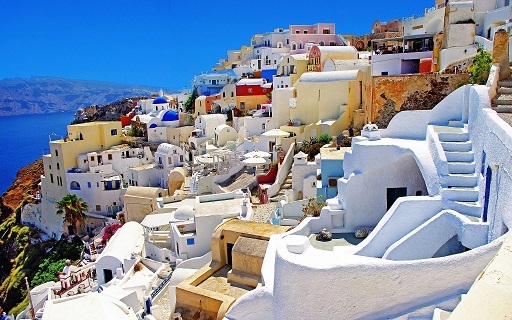 Santorini is an island you have to visit. We met up with some friends from Toronto and Winnipeg in Canada, hired a small jeep and set about exploring every single part of the island. We even took a boat trip to the volcanic island offshore. The only thing we didn't care much for, was the volcanic rock beaches, which wasn't great to walk on. After a week on Santorini Island, it was time to head on back to the mainland to see whether our camper van had weathered the storm. (meaning that it was still there where we left it) Apart from a flat rear tyre, it was good to go. Thanks to two Canadian backpackers we met on Santorini and in exchange for a lift up the east coast of Italy, they offered to change the tyre. We were heading back to the port of Brindisi in Italy and from there all the way up the coast to Venice passing Bari, Pescara and a beach town called Rimini. It was here where we all stayed the night in a luxury hotel compliments of time share tokens I managed to secure while in Athens. All part of getting the most out of your trip. After our Rimini experience, we said goodbye to our two Canadian friends and drove to a pleasant campsite near Venice. The next day Veronica and I took the tourist boat to the floating island. But as we disembarked, it started to rain. That we simply couldn't have so we sat down under a canopy at a restaurant contemplating whether to leave. We didn't have to wait long before one of the restaurant staff said if we weren't going to order anything, we should get up and go. Disappointed, we got back on the boat, but just as we were about to leave, there was a break in the clouds and I said to Veronica, let's get off this boat and take our chances. As it turned out the rain subsided and the sun came out. The rest of the day was absolutely wonderful. We took full advantage of the sunshine and wandered through the narrow streets, window shopping, feeding the pigeons in St Marks Square and just enjoying our time there. 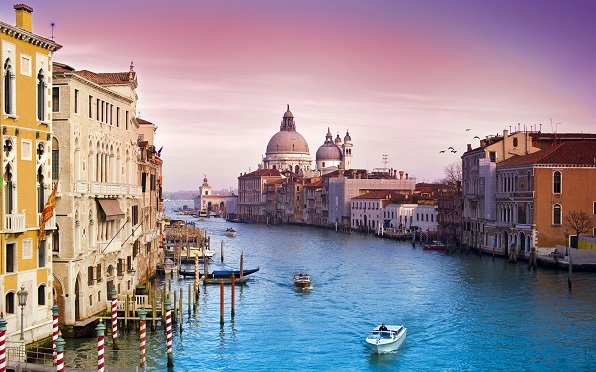 I loved Venice and will go back someday. Leaving Venice in northern Italy, Veronica and I drove our camper van to Austria via the Brenner Pass to Innsbruck. From the overhead bridge, the views were amazing. Some big, broad valleys and even higher mountain peaks as far as the eye could see. The surrounding countryside was filled with various shades of deep green. And thank goodness it was not winter yet as we would not have been able to see just how magnificent it was from as high as we were. 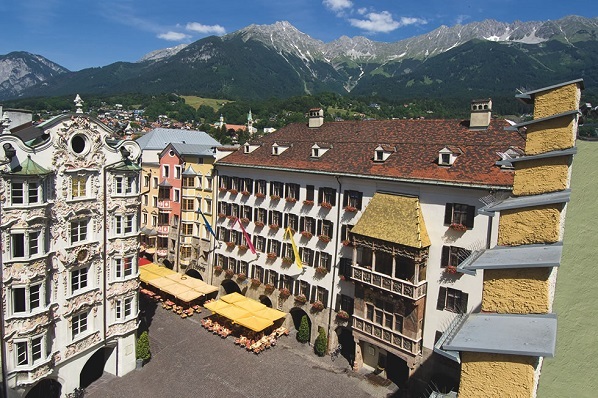 In Innsbruck, we took in all the sights, including the famous Golden Roof. And then for some crazy reason, we decided to visit the zoo here where we saw a couple of grizzly bears. After Austria our next port of call was Germany, but to be honest, I don't remember too much about this place. It could have been due to it not being the best country we had visited up and till then. But what I do remember was trying to locate a certain castle I'd heard so much about in Frankfurt only to find that the castle we were looking for was actually in another country. And don't ask me the name of the castle either. 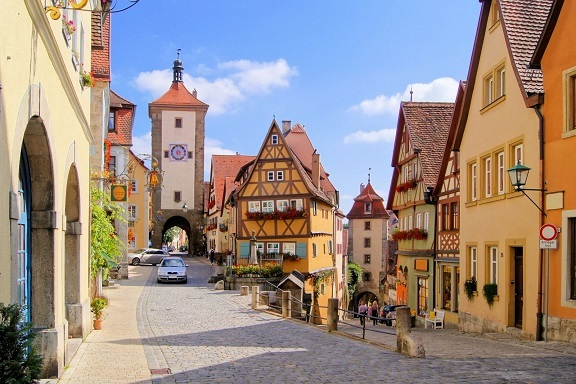 But what we did stumble upon, was a medieval village in a place called Rothenburg ob der Tauber. What a fantastic find this walled town is, in southern Germany. They have a Christmas shop there which is open all year round, seven days a week. It's also the largest shop of its kind in the world. It will take a while though to wander through the different sections. I would have liked to have visited Checkpoint Charlie to see the wall before it was torn down but never got that far. Also, we were here in June so the October beer festival was out of the question. 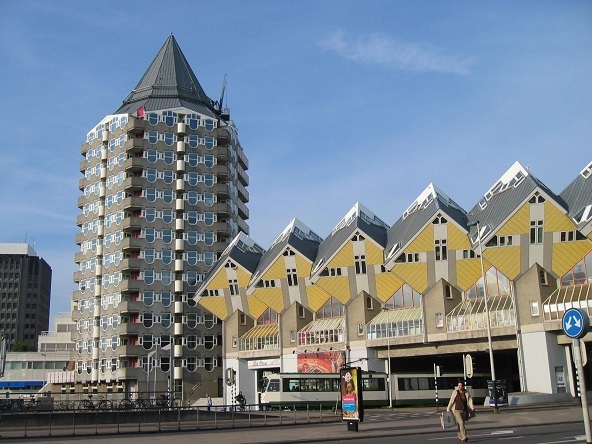 The Netherlands was next on our itinerary, so after visiting a few places in Germany, some of which I cannot remember, we crossed the border into what was then known as Holland and drove to Rotterdam, a city almost destroyed during World War II. I have to say that I really loved this place and all the crazy new buildings that had sprung up around town. I still cannot believe people actually live in these buildings. But one of my favourite cities in the whole world is Amsterdam and not just because of its famous red light district. Amsterdam has so much more to offer and the people here are really friendly too. And even though I could understand the Dutch language fairly well because of my South African background, English is widely spoken. Veronica and I befriended a young Canadian couple and together went on to visit a number of famous city sights. We first visited the famous Heineken Brewery. And being an artist got to see all the famous art museums in town, including the Rijksmuseum where I stood right next to the "Night Watch" an 18th-century painting by Rembrandt van Rijn. We also went to the Van Gogh Museum and the Anne Frank House. Don't go to the Ann Frank House without a box of tissues. I came out of the place with tears in my eyes. It's a deeply moving experience bar none. It wasn't busy when we went there, but the best time to go is as soon as the museum opens in the morning or much later in the day. And the food in Amsterdam is the best in the world, whether you buy fresh food from any street stall seller or you go directly to a restaurant. My favourite is the famous pancake bakery housed in a historic 17th-century warehouse on Prinsengracht. It's only a stone's throw from the Ann Frank House and the Westerkerk. I've since been back to the pancake bakery in Amsterdam on more than one occasion. After the Netherlands, it was back to the UK to drop Veronica off at the airport for her return trip home. It was a sad goodbye. My journey in Europe continued again into France with a couple I had met from New Zealand. So it was back to Calais from Dover and then a drive down the Atlantic coast from Boulogne in the north to Hendaye in the south-west of France. From there we crossed the border into Spain and then on to Portugal. My early travel experiences actually began when I got drafted into the army and as a young man, this would lead me into uncertain and unfamiliar territories such as Angola, Namibia, (then South West Africa) Mozambique and Zimbabwe (Then Rhodesia). 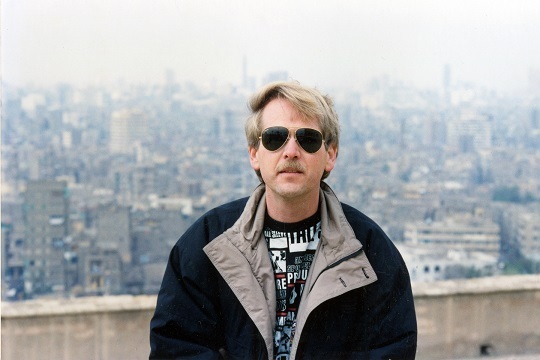 It was many years later that I went on to visit some of the north African countries of which Morocco and Egypt were well within my travel sights. I went by boat from Algeciras, the port in southern of Spain to Tangier in northern Morocco. Two friends and I drove to the town of Fez before going up the Atlas mountains and later to Marrakesh. 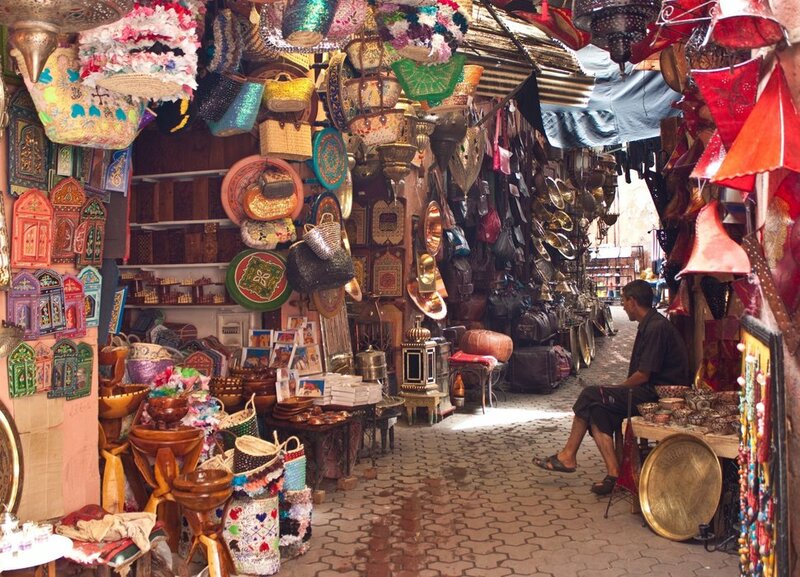 Marrakesh is a fascinating place, but other towns weren't what I had expected. The worst city in the world I visited was Casablanca. I can't say that Morocco is a place I'd go back to in a hurry. I flew from Cape Town to Cairo on Egypt Air. Then a bus trip took me to the town of Alexandria and later a boat ride to Aswan. From there I took a domestic flight to see the massive rock temples of Abu Simbel on the west bank of Lake Nasser which is near the Sudanese border. Besides running my own signage business back home and travelling overseas twice a year, it wasn't enough and as soon as I returned home I wanted to be back on the road. At one stage, on the spur of the moment, I decided to travel to Asia to practice my entrepreneurial skills (which at the time amounted to zero) I had created a product I wanted to sell at home but needed outside help to get it off the ground. This gave me the opportunity to go to China, Hong Kong and Taiwan to find suppliers to put the whole thing together. Little did I know at the time that this project would take me to a place I'd come to love, give me such joy and have an effect that changed the way I looked at life. Though the product was well received at home, it wasn't an easy sell and though initially successful, it didn't skyrocket. What was a success was the fact that I had stepped outside my little-known world and entered another world that was destined to change any preconceived ideas I thought about how other nations go about their daily lives. Not only that, the education I received was priceless.